Convert all popular videos and audios such as AVI, MPEG, WMV, MP4, AAC, AC3, MP3, and so on to iPhone (including iPhone 3G) supported formats such as MP4, MP3, etc; iPhone Video Converter for Mac is a specially developed Mac iPhone converter. This Mac iPhone Converter software provides a series of practical settings such as video crop, file trim, batch conversion, setting video brightness, contrast and saturation, and joining multiple files into one file. Enjoy your movies and music on iPhone, iPod and Apple TV with iPhone Video Converter! 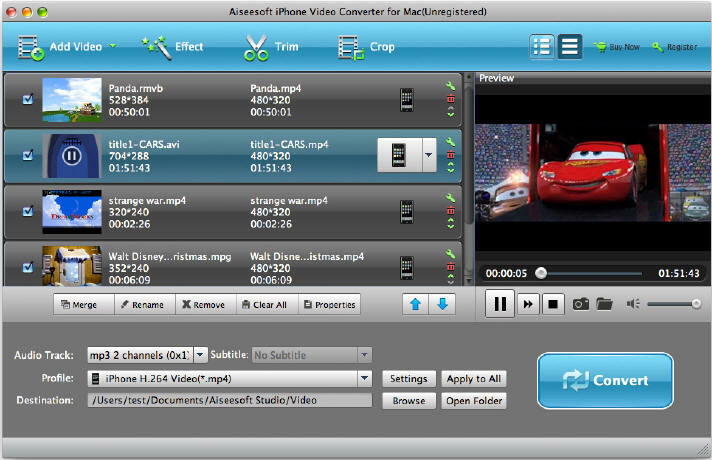 A professional iPhone video converter developed only for Mac OS (include Mac OS X 10.5 Leopard) users. iPhone Video Converter for Mac can convert video and audio for iPhone, iPod and Apple TV, etc. Support MP4, MOV, 3GP, AVI, RM, MPEG, ASF and FLV and so forth. Extract and convert the audio in your video files to MP3, M4A etc for iPhone, iPod, Apple TV and lots of other audio players. Crop video to remove the unwanted sides. With iPhone Video Converter for Mac, you can easily convert your videos to iPhone, iPod, and Apple TV on Mac Operation system. Why Choose iPhone Video Converter for Mac?